It's a very great experience to play HD MKV movies on a big TV screen. However, you may fail to play your MKV files on your TV, such as Samsung or LG smart TV. That's because your MKV files are with DTS audio, which is not compatible with LG, Samsung TV or other TVs. 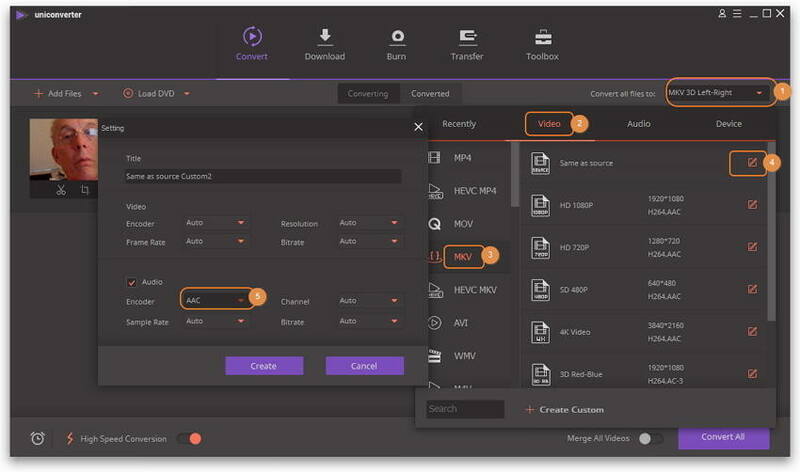 If you are facing a problem when you want to play MKV files on your TV, you have to convert your MKV files with DTS audio to MKV files with AC3 audio. To convert DTS to AC3, Wondershare UniConverter (originally Wondershare Video Converter Ultimate) is the easiest way for you. It is a professional MKV DTS to AC3 converter. With it, you can convert DTS to AC3 just with a few simple clicks. And it gives you the great output effect, without affecting any audio & video quality of your MKV files. Convert files 30x faster than other converters. Convert video to over 1,000 formats including 4K/3D. 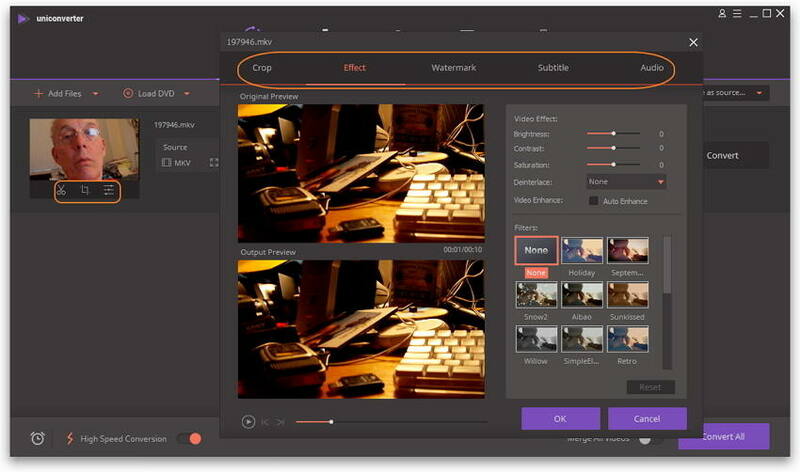 Versatile toolbox includes fixing video metadata, GIF maker, casting video to TV, and screen recorder. This step-by-step tutorial below will show you how to convert MKV DTS to AC3 on Windows platform. For Mac uers, the process is almost the same, so don't worry if you are using a Mac computer. Check it out. To import your MKV DTS files to this program, you can click the Add Files button to browse your computer and select the target files. Another simple way is to directly drag and drop your MKV DTS files from your computer to this app's window. Note that this app supports batch conversion. 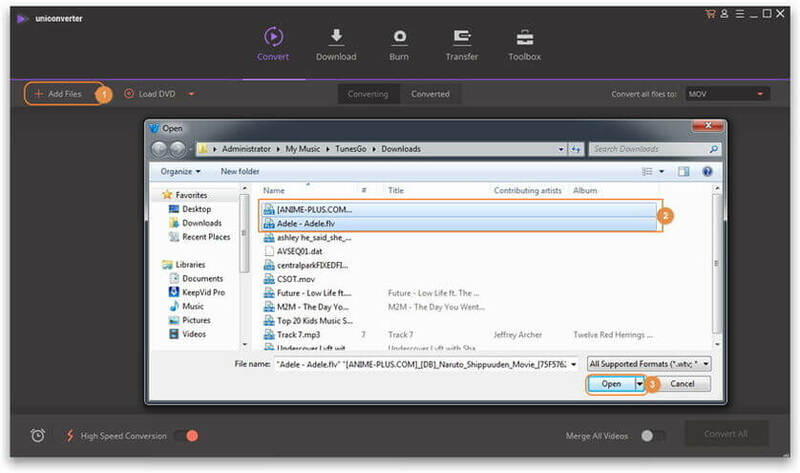 Since you just need to change DTS audio to AC3 audio, you can still save your video files in MKV format. Select MKV as the output format but set AC3 as its audio codec. You need to click the inverted triangle icon at the top-right corner of the main interface, and choose Video > MKV. Then click the Edit icon beside Same as source, and choose AC-3 as audio codec in the pop-up Setting dialog. Then click Create Custom to build the customized MKV. Then select it as the output format. 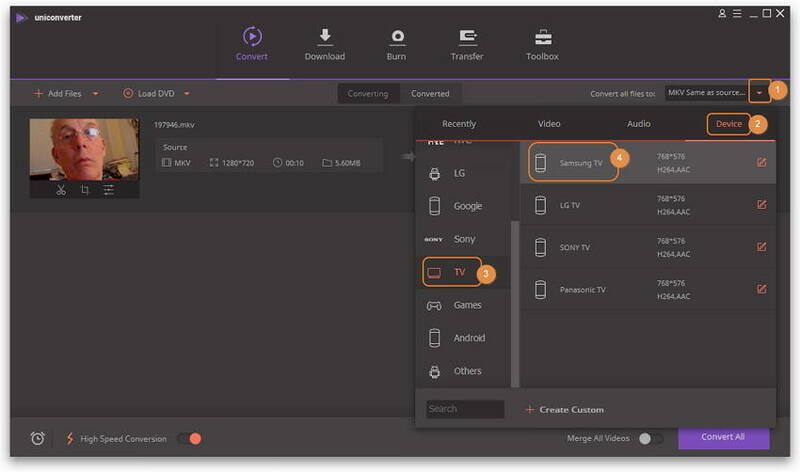 Note: This app directly offers users with an optimized format for Samsung TV, LG TV, Sony TV and Panasonic TV. If you want to play MKV files on these TVs, you're advised to directly select the optimized format for your TV. So, you just go to Device > TV instead, and then select your TV type. Edit your videos if need, such as crop, trim, rotate, etc. Simply click one of the Edit buttons under the video thumbnail to get the editing tool you want. Click the Convert button to start converting DTS to AC-3 audio codec in MKV file. UniConverter (originally Wondershare Video Converter Ultimate) will finish the video conversion in shor time. When it's done, you can get the output files by clicking the Open File Location icon in the Converted tab. Now, just transfer the files to your TV for playback. AC3 and DTS are both codecs which are commonly used in different sound systems to produce high quality audio. Both these formats make use of different technologies in order to encode data and to improve the overall quality of the digital file. Both of these formats have their own advantages and disadvantages when it comes to the compatibility and specifications, and a comparison is required to be made in order to understand which one is to be used for what purpose so that the best audio results are obtained. What is AC3/DTS AC3 (Audio Coding) is nothing but Dolby Digital Audio Codec, which we commonly use these days on most of the audio devices. The audio compression for this format is lossy and Dolby Digital is the most commonly used version of this format which can house up to six sound channels together. DTS is an audio codec which is a part of the Laser Disc, DVD and Blu-Ray specifications, which is a consumer version and used mainly at places where the loud sound is required. This format is used for large music systems and theatrical screenings and it is also a common distribution format for DVDs, for a simple reason that it is compatible with most of the supporting equipment. History Originally named as Dolby Stereo Digital till 1994, AC3 was initially called Dolby AC3 surround sound and later came to be known as Dolby Surround digital, which we now call as Dolby Digital. The work on the development of DTS started in the year 1991, after which it entered the consumer market in 1996. It was suitable for a broad consumer spectrum for multimedia formats and pro audio products. 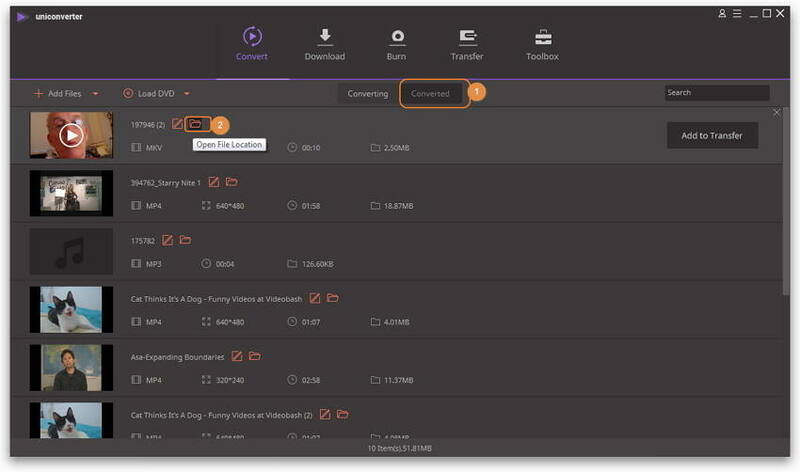 Today DTS is one of the most common audio technology used in DVD players, theatrical screenings, digital media players, high-tech car audio systems and set-top box telecasting as well as Blu-ray discs. Compatibility AC3 is compatible with equipment used for HDTV broadcast, DVD playing, Blu-Ray discs, gaming consoles and home theaters. DTS is used for decoding DVDs and on film prints, especially those which are used for big screen playing like movie theaters and large size projecting purposes. When it comes to the sound output quality, both are almost similar to hear but technically, DTS is better, clearer and sharper than AC3. DTS is louder than AC3, without compromising on the sound clarity. AC3 uses Dialog Normalization, because of which the decoder decreases its volume by 4dB. DTS, on the other hand, does not use any stabilizing, due to which will produce higher and clearer volume. Takes up less memory and disk space. Plays in all DVD setups. Can achieve amazing sound output on home theater systems. Better and louder sound quality. Requires less compression (only 4.1 adaptive). Can house multi-lingual soundtracks without having to change the film. Media is less subject to damage even after multiple screening. Does not sound good when compared to DTS. Produces disturbed sound when volume is raised. Occupies a lot of memory space on the disc. Needs a compatible DVD player and DTS capable receiver in order to play. Does not play in all DVD setups.